There’s nothing like lots of business travel to allow one an opportunity to catch up on some baseball reading. Recently I’ve been working through Bill Nowlin’s ‘Ted Williams at War’, which looks at the Boston legend’s military service years. Not from the perspective of what his statistics might have been had he played the 4.5 seasons he lost, but a chronicle of his day-to-day life while in the United States Marine Corps. Williams trained in WWII but never saw combat. 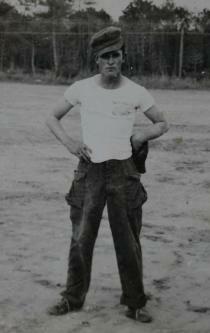 He saw lots of combat, however, during the Korean War. He had a one narrow escape from death on his third combat mission, and he returned to play almost 8 full seasons in Boston. No player with major league service time died in Korea, but some with minor league service did. As the book finished its ramp up to Williams’ 6 months in-theater, it listed a few of the many who gave their lives in defense of South Korea. Three of those men had ties to St Louis baseball, two to the Cardinals. John Lazar was a pitcher in the St Louis Browns organization who joined the US Army. He died in Korea on 7 September 1951. I was not able to find any information regarding the circumstances of his death, and no statistical information for his playing days is contained on Baseball-Reference’s minor league page. Edwin Adamcewicz was born in Norwich CT on 8 November 1929. He was signed by the Cardinals as an outfielder in 1947 at the age of 17, and played 4 minor league seasons for the organization; 3 in class D-ball, one at class C. He entered the US Army sometime during 1951 and was eventually assigned to 45th infantry division, 179th infantry regiment. On 5 May 1952 Corporal Adamceiwcz was severely wounded in action against North Korea (this website offers some details). He survived that day and was evacuated stateside, where he was brought to the military hospital at Fort Devens Massachusetts. Sadly he did not recover from his wounds, passing away on 21 November 52. Raymond Jankowski was born in Locust Township (northeastern Pennsylvania, near Wilkes-Barre) on 23 June 1929. He was a left-handed pitcher and was signed by the Cardinals as a 19-year old in 1948, and played two seasons for the Cardinals in Class D. Minor league baseball was a lot different in the 1940s and 1950s than it is today. The Cardinals had multiple teams playing in at the D level; Jankowski and Adamcewicz did not play together. It appears he either joined the military in 1950 or had washed out of the Cardinal system in 1950, the data is somewhat sketchy. Jankowski joined the US Army and became an Aviation Engineer, meaning he was to help in the construction of airfields overseas where they were needed to support combat operations (it would seem these troops provided a service for the Army much like what Navy Seabees did during the Pacific island-hopping campaign in WWII). He was stationed at Fort Huachuca in 1951, but was involved in a training accident while at the Fort and died from his injuries on 5 November 1951. The Major League players who served in the armed forces during WWII and Korea are well-known. Minor-league ballplayers that did the same are less so. I found some great websites beyond those linked above attempting the tough job of listing these men by name and what happened to them. Veteran’s Day is the Country’s way of formally recognizing the sacrifice our servicemen and women have made over the years, but remembering them doesn’t need to be limited to one day. I’m sure there are other men who played for the Cardinal organization that did not return from the wars of 1941-1953. These men’s names happened to cross my path, and I thought they should be remembered.